Heat oven to 400°F. Heat dressing in large skillet on medium-high heat. Add onion and cook 5 minutes; stirring occasionally. Add mushrooms and cook an additional 5 minutes; stirring occasionally. Spread onion mixture evenly over pizza crust. 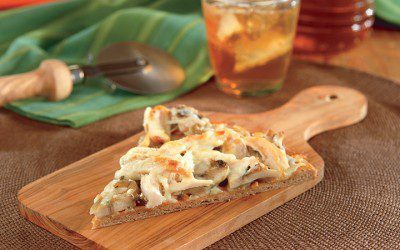 Top with chicken and cheese. Bake 15 to 20 minutes or until crust is crisp. Note: Asiago cheese is an Italian cheese similar to Parmesan and Romano. It works well grated or shredded in salads, soups, and pastas.